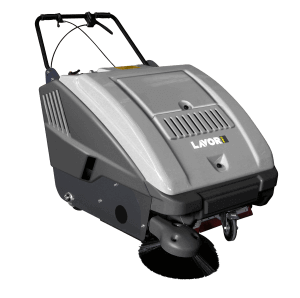 The Lavorpro SWL 900 ET sweeper has a large brush area than the smaller SWL 700 model at 880mm and a larger collection capacity of 60 Ltrs . Other feature include a large surface filter with powered shaker, side brush & main flap raising system togther with pressure regulation on the main brush for optimum cleaning results. Complete with battery and charger. Large surface ?lter with electric shaker ?lter (ET).